The Gruul call them "nephilim," the prey that will not die. They are the gods' proof that the Gruul must never give up the hunt. And they're just one of the amazing sights you'll see from the safety and comfort of a luxury lokopede when you choose Husk Adventure Tours. Our Gruul are the only guides backed by an ironclad Orzhov guarantee. Don't take a chance with your life or the lives of your family when you visit wild and mysterious Utvara! More information available a the Imp Wing Hotel and Tavern, Thoroughfare Utvarazi, No.8. Bring this advertisement to receive 10% off all expenses. A combination of the altitude and exhaustion had finally caught up with the enterprising imp Pivlic, and he finds himself falling out of the sky. Surprisingly, he finds the fall short and soft and he lands on the saddle of a roc. Where the rider had gone he has no idea but he's quite happy to not be dead so what does it really matter? Thankful for the chance to rest, Pivlic takes a look around. Skyjeks have taken flight as expected, but they're not headed towards the nephilim, they're headed towards... oh no. The imp is helpless to stop the Parhelion from crashing into the dome of Prahv, and he watches as taking three of the six Towers of Justice crumble and fall. The towers at least seem to have cushioned the impact of it destroying Prahv completely and the remaining towers seem to be holding it up for now. There was a chance there were still survivors, and a chance that Teysa is still alive. He can't do anything about the nephilim, but he can still save her at least. 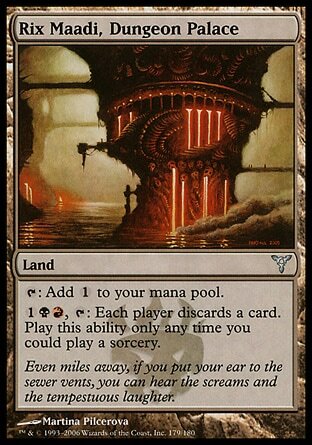 There is one nagging question however, why aren't the Boros stone titans active and defending the city? Section Commander Migellic demands answers to that very same question, and the guildmages aren't quite sure. The titans are old and they don't fully understand then anymore. Zobor of the Tenth District had fought against the Golgari during the Decamillenial celebration before he fell so they should still be working. The answer might lie in the fall of Parhelion. The titans were said to be powered by the angels themselves, if the angels are gone, maybe the titans are just statues now. The symbol of the might of the Boros Legion and the sense of security they provided are no more. Migellic orders all reserves to duty. Time to open up the armory. They'd have to do this on their own. They don't bother with explanations or demands, Jarad simply set his Golgari forces against the guards of the hive shaped Rix Maadi , and the flies right on in. The Rakdos fight fiercely but the Golgari force has the air advantage to use to their advantage. Past the gates Fonn and Jarad fly above the unprepared cultists. Fonn points the way thanks to her song sense of Myc, and Jarad realizes they're heading straight to the death temple in the center. They locate a vent that will take them straight to it but they have to leave their mounts behind. They dismount, and Jarad wants to know the plan. "We follow this tube into the temple, kill all the Rakdos inside, and get Myc back." "Good plan," Jarad said. "I always said you would have made an excellent huntress." Fonn appreciates the sentiment and thinks guiltily that maybe it takes danger for their marriage to work. Myc watches Rakdos rise from the scalding lava. The embodiment of fury and chaos himself. Lyzolda finishes her chant and draws the bowl to her lips. Before she takes her first sip, an arrow knocks it out of her hands and more sever the rope binding Myc's hands and feet. Myc pulls himself free but not before the blood mixture from the bowl spills all over both himself and the demon-god. Myc is no longer just Myc. He's full of rage and hate and a need a kill. 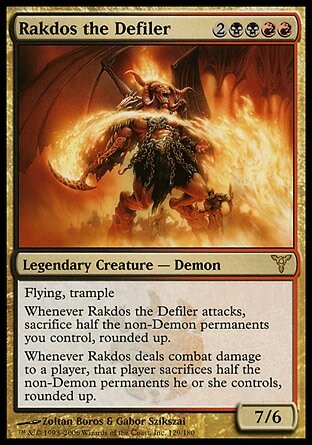 Rakdos looks down at him and Myc feels the demon's curiosity and sees through his eyes. Rakdos slaps Lyzolda out of the air and he picks up the elf boy. Inside Myc's head he hears the demon speak. I hunger, the mind said. What are you, I wonder? A morsel? Myc tells him no, but he can feel the demon's hunger as well. They must feed. Feed, Myc told him, on those clowns first. Yes, the demon-mind agreed, and Myc saw the demon taking in the crowd in his mind's eye. I hate clowns. Fonn and Jarad watch their son in the demon's had, call out his name and looks for the quickest route to him. Jarad pulls out a grappling hook and searches for something for it to grab hold of when Fonn yells and points toward the demon. They watch as it almost delicately places their son on its shoulder, and he settles himself securely within the links of its massive chain. Their son smiled vicious as he looked upon the mod and paid no attention to either of them. Fonn sees the other cages, and decides to go for the other children while Jarad tries to do something about the demon. No we know why Herndon spent so much time on the clowns. Like I said before, I'm not fond of them, but at least it is possible for clowns to exist within this world. Herndon could have chosen something else more palatable, but if this is the facepalm moment of the book, it's not horrible or anything. Some people will probably even enjoy this moment and laugh, and they'll have every right. Clowns just aren't for me. It's certainly an improvement over the "crossing the fingers" incident in Guildpact and a thousand times better than the "I lost because I was hungry" moment of Ravnica. Just because it turns out that there is a reason for that explained two books later doesn't make the initial read any better. I understand Herndon wanted to use a child-like sentiment to really make it clear that the two minds were now one, but it could easily have been replaced with something more fitting. Although I'm not fond of it, it also could have been much worse. So to that end I'm thankful. Let's move past the clowns and look at the bigger picture. I like this new development. Looks like I was right. 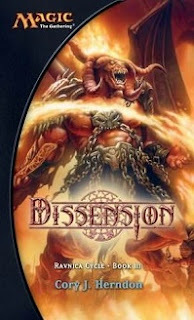 The Cult of Rakdos really will end up being a force for good in this novel, the cover really does depict one of the protagonists of the story like the other two before it and now we have a better idea of where this whole part of the storyline is headed. But will they really be the ones to fight against the Nephilim, or will they also help out against Momoir Vig, Savra/Svogthir, and Szadek? With Kos as an Avatar, Feather as the Boros guildmaster, and with Jarad and Rakdos in the mix we might be headed for a guildmaster (or guild representative) vs guildmaster face off. I love seeing so many prominent faces from the cards showing up. I can't wait!